The United Nations General Assembly has voted on over 4500 resolutions or other matters since its founding through 2008. This Demonstration, based on data made available by the Institute for Quantitative Social Science at Harvard University, creates pie charts showing the distribution of votes on almost all of those resolutions. You select a subset of the resolutions you wish to study, such as all resolutions containing the word "Israel" or the word "Africa". You then move a slider to select a particular resolution from this subset. 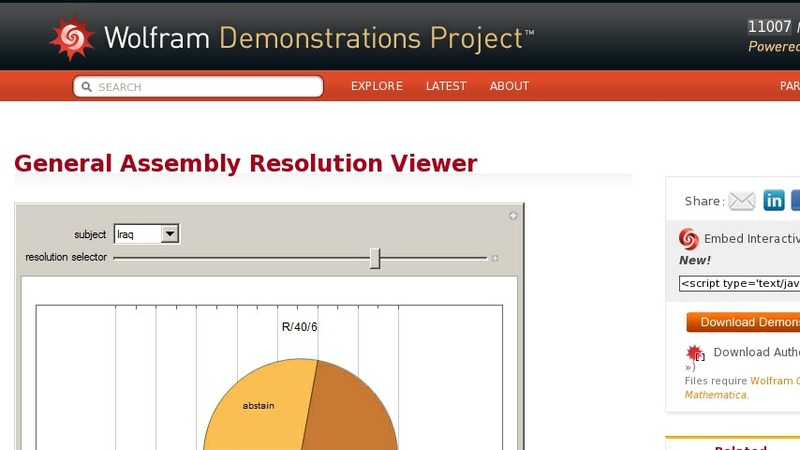 The Demonstration responds by insetting a pie chart on a timeline showing the distribution of votes. If you hover your mouse over the short name of the resolution, a tooltip appears showing the date of the vote and providing a longer description of the issue.